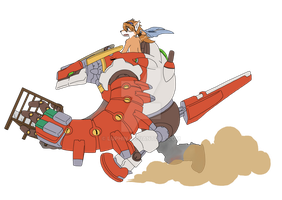 Skin of Red Savarin, the main character of the great DS game "Solatorobo: Red the Hunter". I like it because it have pretty full colors and it have a cute nice face. This skin is my personal favourite and yours? On all 5 Stars anyone feels like me? This looks very nice, I love the detail included. It's nice to see a good Solatorobo skin out there, and I'm proud to be able to use it. You should make more of Solatorobo skins,It's awesome! This is awesome. If Minecraft stops messing me around, I will use this :3. I love it! I'm gonna use it for sure! the best skin ever! If there was a way to have this onn the 360 edition of minecraft i would have it!! I'm using this skin right now, ITS EPIC goes great with my sky city! How do I use this skin? you got a download link on my author comment that'll take you to the download page on Planet Minecraft. please i'ts very nice send me in marcbarrer@gmail.com thanks !!! You got the download link on the author's comment. Wow ! minecraft skin !! Yeaaay ! I'm glad you liked it. Spreading it around would be nice, since it'll get people to know about the game he's from. My only complain is that the combas system could have a bit more than just grappling. But other than that, it's a pretty fun and solid experience.